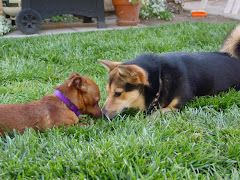 This past weekend, I was invited to a meeting of Pig and Pepper. It's a group of women who get together every month or so and just have fun. Daughter Karen's BFF TiJae conceived the idea and named it. I would love to know how she came up with the name! One month they got together at Color Me Mine, a paint-your-own pottery studio. One month they went to a spa for a day.... It was a special day at the spa with a low rate for that day, and they enjoyed the facilities, robes, tea and the overall relaxation opportunity and then went out for a meal together. The younger generation of this group is my daughter Karen's age, roughly. And the moms of some of these young women come from time to time also. I believe next month involves a French restaurant. The dress code, last I heard, was all black, with a pink boa. (Darn! I have a purple one from my encounter with Eleanor Burns, but not a pink one! Come to think of it, I don't really have a black outfit either, but perhaps I'll come up with something!) I'm not real big on eating out, but I really enjoyed my time with these women. I had a ball with them last Saturday! 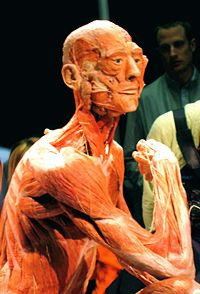 We went to see Bodyworld in Los Angeles, at the California Sciencecenter . It was the last day of the exhibit and there were lines... but it was well worth it. You could not take pictures inside the exhibits, but I found a few online from write-ups about it. 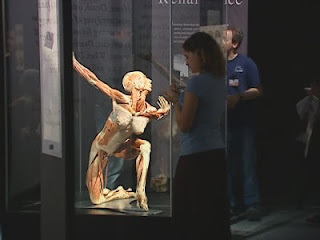 You can use this link about to read about the process by which the actual human bodies are preserved with a method called "plastination". The whole concept may seem off-putting to some, but I can vouch for how absolutely fascinating the displays were. 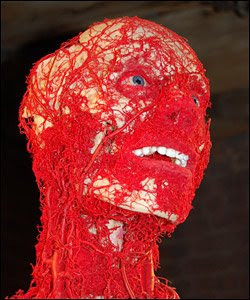 This is why a facial injury bleeds so profusely - look at the blood supply of the head! Many of the figures were in dance positions, or sports positions, such as gymnastic feats. They had various layers of skin removed, revealing internal organs or nerve branches or blood vessels. Again, I know some would say "Ewwwwwwwww", but I was just in awe of some of the things I was able to see. I find this one particularly graceful. 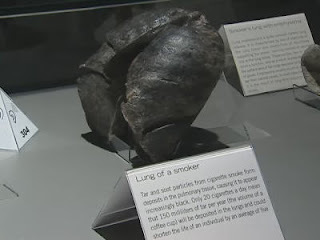 This is a normal pair of lungs. 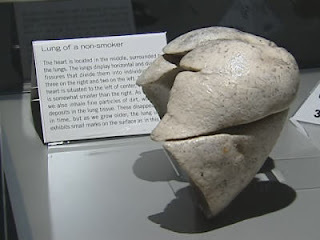 This is a smoker's lungs. Enuf said. After viewing the exhibits, we took off for Little Tokyo and after a brief adventure trying to find the freeway we really needed, we ended up at one of the group's favorite Asian restaurants. The food was plentiful and SO good! All in all, it was a really nice day! I enjoyed being with everyone (had not seen Janet, TiJae's mom, in way too long!) and I look forward to the next Pig 'n Pepper!